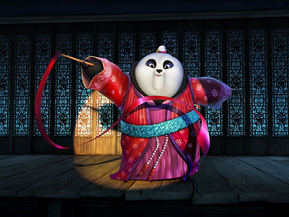 One of the pleasures of the Kung Fu Panda movies is that each installment develops the titular character in a different way, and not just by supplying him a new villain to thwart, but also giving him a deep personal struggle that forces him to grow - physically, emotionally, spiritually. This may sound silly given the main character is a plump, wide-eyed panda named Po (voice of Jack Black), who has an insatiable appetite and practices martial arts in ancient China, but expanding any character we care about is one of the reasons we enjoy storytelling in the first place, and if that character happens to be a jovial panda, so be it. In my review of Kung Fu Panda 2, I mentioned that I hope the filmmakers extend the series into a trilogy, and it looks like directors Jennifer Yuh and Alessandro Carloni have done just that. And although this latest entry is lively, warm-hearted and tells a worthwhile story, I do think it’s time they retire Po and company. Kung Fu Panda 3 isn’t as cutting edge, funny or memorable as its predecessors, but it does allow the series to end on a high note, so the filmmakers should probably quit while they’re ahead. This time around, Po’s kung fu skills are tested on a metaphysical level when he must learn to harness his inner chi, or the life force that flows through all living things. He’s told only a true chi master can defeat Kai (J.K. Simmons), an evil bull warrior who reignites a 500-year-old feud with Po’s grand master, Oogway (Randall Duk Kim), in hopes of becoming the sole ruler of the universe. Just before Kai steals Oogway’s chi, the latter tells him the Dragon Warrior will defeat him, and although Po has been told he is that warrior, it’s now something he must prove.